by Chris Woodford. Last updated: June 4, 2018. Buying yourself a new computer can be a daunting prospect. There are literally hundreds of different models to choose from and, what's worse, they all look exactly the same! Compare the specifications and you'll find that looks aren't the only thing they have in common: unless you know your Wi-Fi from your Bluetooth and your Linux from your Windows, you'll be hard-pressed to tell one machine from another. It's hardly surprising that most computer buyers make a few feeble attempts to compare a handful of likely contenders and then just pick something more or less at random based on whichever brand sounds most familiar. But isn't there a more scientific approach to parting with your hard-earned cash? The best thing you can do is make a list of all the features that really matter to you, make a shortlist of half a dozen different machines, and then see which machine ticks the most boxes. But whether you go for the scientific approach or just trust your gut, here are some things to think about before you fill your shopping cart and click "checkout." 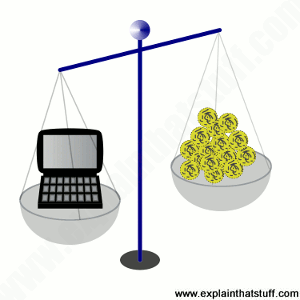 Photo: How much computer can you get for your money? Desktop or laptop? Laptops are more convenient than desktops if you don't have a lot of room, and use less energy, but they're easier to damage, harder to upgrade, and cost more to repair. This is absolutely the most important question when it comes to buying a new computer. Most home users do little more than browse the Web, send emails, word-process the occasional letter, download MP3 music tracks, and store and process photographs from a digital camera. For basic Internet (email and Web) work and word processing, all you need is a basic computer—you don't need anything fancy and you certainly don't need to worry about getting the very latest model. Processor speeds and hard drive sizes are virtually irrelevant if you'll do nothing but Web browsing and sending emails; even a 10-year-old secondhand laptop may be good enough (though it will struggle to run the latest Web browsers and it may not have things like USB ports and wireless Net access). If you'll be using your computer to manage music tracks on an iPod (or other MP3 player), the most important thing you need is plenty of hard disk space—but virtually any new computer will have more than you could possibly need. (As a general rule of thumb, I suggest multiply your iPod's storage capacity by 2–3 and aim for a hard drive that size to ensure you have plenty of room for other things.) When it comes to storing videos and digital photographs, storage is rather more of an issue. But even if you buy a computer with a hard disk that turns out to be too small, you can easily add an external drive at relatively low cost to overcome the problem. Alternatively, you can now buy USB flash memory sticks that have as much memory as an average PC had just a few years ago—and they make great portable backups. In short, as far as most home users are concerned, virtually any new off-the-shelf computer will be able to handle what you want to do. The only exception is people who like to play games (either alone or online). If you plan to do a lot of that, you'll need a computer with a fast processor—and the processor speed will probably override all other considerations. If you're a games player, always buy the fastest machine (the one with the highest processor speed) you can afford. Laptop, desktop... phone or tablet? Photo: Do you even need a computer anymore? 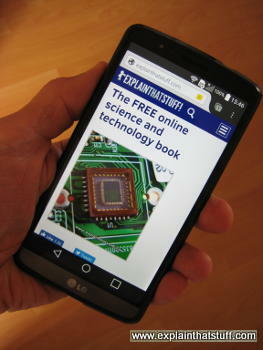 Most modern websites—including this one—are specifically designed to show optimized mobile versions on smartphones, like this large-screen, high-definition Android "phablet" (a cross between a phone and a tablet). Laptops are guaranteed to make themselves obsolete every three or four years. Unlike desktop computers, you can't easily upgrade components when you outgrow them or replace them when they fail. You can add more memory easily enough (though there's usually a limit to how much), but you can't add a bigger screen or a new hard drive without quite a lot of hassle. Laptops are much more flimsy (less robust) than desktop machines—ironic, given how they have to put up with more abuse—and expensive to get repaired. In particular, the keyboards on laptop computers are not designed for industrial-strength daily use. You'll soon wear out a laptop's keyboard if you pound it heavily for 8 hours a day and you'll find the cost of replacing it can be about 20–25 percent the cost of a new machine! If, like me, you spend your entire life typing, and you prefer to use a laptop, the best thing to do is to invest in an external USB keyboard (maybe a wireless one for convenience). Plug it into your laptop and use it every time you do a lot of typing. If you spill coffee on an external keyboard or wear it out, it's a mere $10 for a new one; ruin your laptop's built-in keyboard and you could face a bill of $200 or more. If you find an external keyboard means you have to sit too far from the screen to read it properly, buy yourself a stand for the laptop and put the keyboard just underneath it (or use a couple of telephone directories). If you get a small external keyboard, you might find it will perch snugly on top of your laptop's existing keyboard without causing any problems. Even if you always use your laptop in the same room in your home (mine is permanently sitting on a desk plugged into a printer, external keyboard, and so on), that doesn't necessarily mean a desktop is a better bet. I often work away from home so it's brilliant to be able to unplug the laptop in a couple of minutes and take it with me; I couldn't do that with a desktop. On the other hand, if you organize your files sensibly, you can probably just copy your entire "My documents" folder onto a USB stick and take that with you, and if you use a web-based email service like Gmail or Yahoo!, you don't need to take your laptop with you at all. On the positive side, laptops use much less energy than desktops, so switching to a laptop is a sensible decision if you care about the planet. According to the EU's Energy Star energy-efficiency labeling scheme, a laptop uses just 50–80 percent of the energy you'd use with a desktop—savings that will really mount up if you use your machine perhaps 8–10 hours a day, 365 days a year, for several years. A few years ago, all you had to choose between was a laptop and a desktop. Now there are all kinds of mobile devices too—and fast mobile broadband makes it possible to do things online on a mobile almost as quickly as you can on a desktop. If you do a lot of online reading but not a lot of typing, you might find a tablet serves you better than a laptop—and an ebook reader (such as a Kindle) could be even better, since it's likely to have very long battery life. Conversely, if you like to work in all kinds of places around your home and you do type a lot, a tablet might be too annoying (though you can add separate Bluetooth keyboards to many of them, effectively turning them into laptops). If all you want to do is check your emails on the move, do you even need a tablet? Maybe you'd be better off with a high-spec smartphone—particularly the kind of large-screen phone sometimes referred to as a "phablet" (because it's, in effect, half-phone, half-tablet). The bottom line is that it pays to give some thought to how, where, and when you'll use a computer before you buy it. Most laptops now come with a multi-function audio CD-player, CD-ROM drive, CD rewriter, DVD, and DVD rewriter—so you don't have to worry too much about this. (You can always add an external USB CD or DVD drive if you need to do.) The appearance of Blu-ray drives adds a new complication, but don't worry about them too much unless you're a games player. Most of us can cope with a standard CD/DVD reader and rewriter, which will come with most new desktops and laptops. Compact discs and DVDs are going to be around for a while yet, even though, for a lot of us, it's all about downloading now. One area where laptops, in particular, have changed considerably over the last decade is in the size of their LCD screens and their aspect ratio. Older laptops had much squarer screens; the latest laptops have widescreens so you can watch movies from DVDs. Don't worry too much about screen dimensions unless you plan to watch lots of movies on your computer. But if you're planning to do lots of Web work and you're buying a small computer with a tiny screen, bear in mind that many, wider websites will display with scroll bars (only showing part of the screen at a time)—and that can get a bit irritating after a while. Photo: My last three (Toshiba Satellite Pro) laptops. The 1996 model on the left has a tiny screen and a really chunky (but amazingly robust) case with built-in power supply. This machine was literally built like a tank! In the middle, we have a low-cost Toshiba from 2004. It has a much bigger screen and a huge touchpad and wrist-wrest. The case is also much thinner, but flimsier too. The 2007 model on the right is clearly designed to double as a DVD player. It has a widescreen display and the keyboard wrist area is much smaller. Note that the photos are not taken to the same scale. Computers used to be solitary machines you used in the comfort of your own home without worrying about other people; now, thanks to the Internet, and things like Facebook and Twitter, they're a much more social phenomenon than anyone ever expected: 21st-century home computers are more like super-enhanced versions of 20th-century telephones. That's why most computer users now expect their machines to be online the whole time. If you're buying a laptop, and especially if you're getting an older model secondhand, make sure it has a wireless networking (Wi-Fi) card built in so you can use it all around your home (you will need to buy a separate wireless broadband modem/router or a mobile broadband dongle as well). Some laptops still have built-in dial-up modems, but they're much less useful than they were; it's virtually impossible to use the web without broadband these days because most websites are deliberately designed to make use of faster connections. 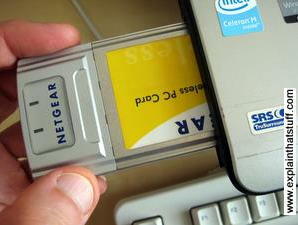 Photo: If you buy a secondhand laptop and it doesn't have a built-in Wi-Fi card, you can always buy a PCMCIA adapter card (made by companies such as Netgear and Belkin). It's a bit bigger than a credit card and it just slots into the side of the machine. If you're using Windows, the card should install itself automatically. You can buy these cards amazingly cheaply on auction sites. Ten years ago, the smartest way to buy a laptop was to get a two or three year-old secondhand machine at a fraction of the cost of a new model. Having spent a bit of time looking at prices on eBay, I get a sense that you can currently buy a 2–5 year-old secondhand laptop for about a half to a third the price of a new one. Bear in mind the drawbacks of going the secondhand route: you can spend an inordinate amount of time on auction websites checking out the features of secondhand machines and worrying about whether they're still up-to-date enough for your needs, the reliability of the seller, whether the machine is stolen, and all kinds of other things as well. A few years ago, I would have advised students and people on low budgets definitely to buy secondhand; now, it's harder to see a justification for buying secondhand unless you're really pushed for cash. If you're environmentally minded and interested in recycling, it's relatively easy to find refurbished, ex-corporate machines on eBay; you might not save that much on buying a new model, but you'll have the satisfaction that you've saved one more machine from a landfill in India. Laptops are high on the list of items when it comes to auction fraud, so make sure you buy secondhand machines from reputable sources (ex-demo or reconditioned models are sometimes available from official dealers). Decide broadly on what you want. Say it's a Toshiba laptop with a reasonable-sized hard-drive (maybe 30GB) and a decent memory (512MB or 1GB). Do a search on eBay and see what's on offer. Sort the list of items into those ending first. Identify maybe half a dozen models and watch them move through the bidding process. Don't bid on anything at all at this point. There are dozens and dozens of laptops for sale all the time so don't worry about missing out. All you're doing at the moment is research. Watch what sort of prices the machines finally sell for (probably roughly the same amount give or take maybe 20 percent). Now go away for a while and consider the amount you'd be happy to pay (call this your low figure) and the maximum amount you will possibly pay (call this your high figure). Find out how much a new machine would cost so you can get a sense of whether a secondhand purchase is really worth it. In a day or two, search again for a list of models that meet your requirements. Narrow down to about four or five and bookmark them. There are so many machines for sale, all the time, that you can easily afford to be picky: eliminate any with obvious defects that really bother you (but if there are defects you can live with, like cracks in the case or non-functioning sound cards, see that as an opportunity for a bargain). Eliminate any from dubious sellers (I'd suggest eliminate any sellers with very little feedback and any with less than 99 percent positive feedback—and be sure to read any negative feedback very carefully). If you can't be bothered with bidding, look at "buy-it-now" items. See if any of these have suitable specs and come within your price range. Buy-it-now isn't always more expensive than a straight auction, even if the prices seem high to start with. And it's a lot less hassle than waiting for an auction to end. Make a careful note of the ending times for the models that interest you. Now forget all about your items and go away! Don't bid and don't even waste time looking until the last five minutes of the auction. When you're entering the last five minutes, look at the item that interests you. Is the price above your high figure? If so, forget all about the item and move on to one of the others. If the price is above your low figure but below your high figure, stick around and watch how the bidding develops—but only watch. Do not bid! If the bidding price is lower than your high figure, put in your bid sometime in the last 30 seconds. Be fully prepared to put in a bid in the last 5–10 seconds if you really want an item. And expect other people to do the same. If you win, great. If you lose, it's no big deal—there are plenty more items just waiting. Some golden eBay rules: At all costs, avoid dubious items and items from dubious sellers. Buy only from people with very high positive feedback. Do not bid in auctions until the last minute; it's a complete waste of your time, pushes up the price, and encourages you to spend outside your budget. 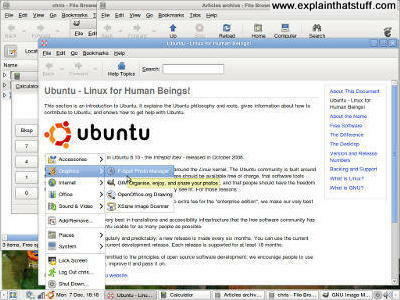 Photo: A version of Linux called Ubuntu is the third most popular operating system after Windows and the Mac operating system. Once it's up and running, it looks and works (to an end user) in much the same way as those others. Fixing technical problems is more of a challenge, however. A few years ago, no one seriously considered buying anything other than a Windows PC. Apple Macintosh machines were the preserve of graphic designers and people in the creative world, but for everyone else there was only one way to go: Microsoft. Following the rise of the Internet (and the iPhone), things have changed considerably: Macintosh computers are now more affordable and more compatible with Windows PCs than they used to be. If all you plan to do is surf the Web and write the occasional letter or essay, it doesn't matter whether you use a Windows PC or a Mac. If you prefer the smart and stylish Steve Jobs vision to the geeky utilitarian approach personified by Bill Gates, you can plump for a Mac with no qualms—or fear. Over the last few years, the appearance of Linux (a freely available "open-source" operating system that shares advantages of both Windows and Mac) has given computer buyers something extra to think about. The beauty of Linux is that it costs little or nothing so a computer that ships with a Linux operating system can be considerably cheaper than the same model shipping with Windows. That's one reason why netbooks (small-scale laptops like the Asus Eee PC) are sold at such low prices. Although Linux is much more affordable than Windows, you might find problems making peripherals (printers, scanners, webcams, and so on) work correctly, though this is less of a problem than it used to be. If you're wondering which operating system to use, it might be worth bearing in mind what's running on your smartphone. An Apple desktop computer will be a bit more compatible with an iPhone, for example, and synchronizing your music library is a little bit easier too, because iTunes runs on both platforms. But it's relatively easy to use any kind of desktop with any kind of smartphone. I used to run a Windows desktop and an iPhone, for example; now I have a Linux desktop and an Android phone. You can reasonably expect everything to work with anything—and most of the time, you won't be disappointed. If you're a basic home user and you'll be Web surfing, sending emails, writing letters, and storing photos, almost any off-the-shelf computer will be fine for your needs. Don't worry too much about processor speeds or hard drive space. If you'll be storing lots of photos or music tracks, make sure you have plenty of hard drive space. If you're a games player, you'll need a machine with a fast processor. If your machine will be used all round the home by different members of your family, in different rooms, a laptop with wireless Internet is a good choice. If you work from home and plan to use a computer all day long, a desktop is a better bet than a laptop—or use a laptop with a plug-in keyboard (and possibly plug-in screen as well). If your computer hasn't got exactly the features you want, don't worry. Virtually all machines have USB ports (for plugging in extra equipment). Simply buy yourself an external mouse, keyboard, hard drive, webcam (or whatever), and plug it in. If you're on a tight budget, consider a secondhand or reconditioned machine. Be sure to buy it from a reputable source. Consider whether the money you're saving is really worth the extra worry and hassle. If you're buying introductory computer books, it's worth noting that the ones you'll generally see in book stores (in the real world and online) will have been written several years ago and may not exactly match how your system is set up. (For example, it can be very confusing and annoying to read a book based on Windows XP if you're using Windows 7 or 10.) It's often helpful to get books from libraries first and pick the ones you like best before you buy. Anything written more than about 3/4 years ago may now be unhelpfully out of date. Windows 10 For Dummies by Andy Rathbone. For Dummies, 2018. Helpful advice and good for new computer users. The Dummies books are generally updated quite regularly. Windows 10 For Seniors for Dummies by Peter Weverka. John Wiley, 2018. Geared more to older readers than the traditional Dummies books. PCs For Dummies by Dan Gookin. For Dummies, 2015. This book has been in print for a few years now and is regularly updated. If you're buying it, make sure you get one that matches your current operating system. How Computers Work by Ron White. Que Pub, 2008. Quite a good reference, though you may not want to know "how your machine works" so much as "how to make it work for you"—and there is a big difference.